During the Saturday different questions are going to be discussed: Do we have a migration crisis? What is actually going on and what kinds of threats are out there in sense of migration? What are the challenges people returning to Estonia have to face? In addition, an eye-opening value game and exciting experiment are taking place. Also there is an opportunity to experience the virtual reality of refugee camp in Jordan. All Migration Area panel discussions are translated simultaneously into English. Meet Sidra. This charming 12-year-old girl will guide you through her temporary home: Za’atari Refugee Camp in Jordan. Za’atari is home to 130,000 Syrians fleeing violence and war, and children make up half the camp’s population. The game „Discovering Values“ combines an entertaining format with a serious content that supports the development of one’s value clarification, argumentation ability and empathy. The game is meant to facilitate discussion with the aim of forming, formulating and defending a personal position, with no right or wrong solutions. The migration crisis and refugee problems are discussed through mass media often in a way that anger and fear are following. What is actually going on and what kinds of threats are out there in sense of migration? The discussion is held in perspective of security and collective defense. 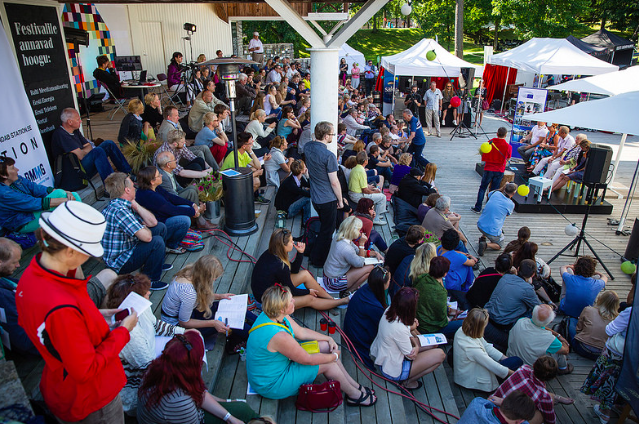 In recent years, discussions about the migration crisis have dominated Estonian public sphere. Statistics show that there is no mass immigration into Estonia – there are no migrant flows targeting us. But how could we explain then this sense of crisis in Estonia? Surveys are showing that Estonians are not that open-minded towards immigrants and often have certain prejudices particularly towards those with different ethnic background. At the panel, an experiment is going to take place where the audience can have their say in this matter and the mechanisms of development of beliefs and attitudes are discussed by experts in the field. From when Estonia regained its independence 25 years ago, more people have left the country than moved here to contribute in Estonia’s social and economic wellbeing. The country needs to promote immigration of foreign specialists as well as to work on its diaspora engagement policies and thats what this panel discusses. The Migration Area is organised by Estonian Refugee Council, Estonian Atlantic Treaty Association, European Migration Network/University of Tallinn, Ülemiste City, Tartu University Centre for Ethics and Ministry of the Interior, Government Office. The activities of the Migration Area shall be financed from the European Asylum, Migration and Integration Fund and the budget of the The Ministry of the Interior of the Republic of Estonia, under the project project of AMIF2015-14 „Monitoring and Communicating Immigration Crisis.